There has recently been lots of innovation in the handset financing space, giving us newer and more flexible alternatives to the 24-month contract. Over the past decade, smartphones have become increasingly advanced but at the same time, they’ve also grown massively in price. Back in 2007, the original iPhone cost £269 whereas today, you’ll pay £999 for the latest iPhone X unlocked and off-contract. With almost a four times increase in cost over just a decade, it means handset financing is now more important than ever before. 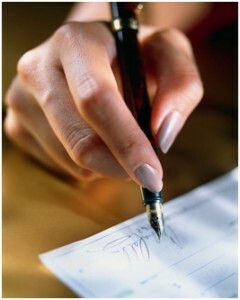 Historically, the most popular form of handset financing has been the 24-month contract. For something like the iPhone X, you might take a 24-month contract paying something like £60 per month. This gives you an allowance of minutes, texts and data to use every month and you’ll get a handset with reduced or no upfront cost. The cost of your handset is rolled in to the monthly fee, often with very little transparency and limited flexibility. Mobile phone contracts also typically have hidden APRs that are hard to work out. In this article, we’ll explore alternative handset financing options that can save you money and give you greater flexibility than you’d get on a 24-month contract. Payment Plans: This involves buying your handset on a separate plan to your mobile tariff. You’ll pay for the handset over 6 to 24 months with interest. PCP-Style Plans: A payment plan where you’ll typically trade-in your handset after 12 or 24 months. The following table shows an overview of the three handset financing options. We’ve shown the approximate cost for a 64GB iPhone X over 24 months, assuming a data plan with at least 2GB of data per month. Handset owned at end? ✔ Yes. Handset belongs to you at end of contract. ✔ Yes. Handset belongs to you at end of payment plan. ✘ No. Assumes trade-in of handset. Flexibility to change network/tariff ✘ No, tied in for duration of 24-month contract. ✔ Yes. Typically, you can change network/tariff. ✔ Yes. Typically, you can change network/tariff. Flexibility to change handset ✘ No, unless you pay an early termination fee. ✔ Yes. Handset plan is separate from tariff. ✔ Yes. Handset plan is separate from tariff. Transparency of pricing ✘ Low. Combined price and hidden APRs. ✔ High. Clearly separated costs for handset & price plan. ✔ High. Clearly separated costs for handset & price plan. 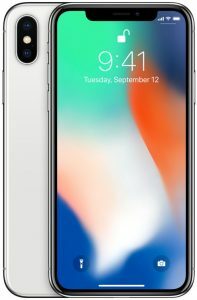 * Approximate total cost for an iPhone X over 24-months with 64GB of storage and a 2GB data plan. Includes both the handset cost and tariff cost. Pricing correct as of 5th December 2017. Through the rest of this article, we’ll discuss each of the three handset financing options in more detail. Traditionally, the most popular form of handset financing has been the 24-month contract. On a 24-month contract, you pay a single all-in monthly fee. This single monthly payment covers the cost of both your handset and your airtime. For instance, if you’d like an iPhone X with at least 2GB of data per month, you might pay in the region of £60/month. You’ll also pay an upfront fee of up to £300. Traditional 24-month contracts for an iPhone X with 64GB of storage and at least 2GB of data per month. Comparable SIM-only contracts on each mobile network with at least 2GB of data per month. Tariffs may not be exactly comparable to the above as the exact allowances may differ slightly. The difference in how much you pay every month is due to the fact you’re also paying for your handset on the 24-month contract. 24-month contracts often work out to be fairly expensive. Typically, they’re more expensive compared to other handset financing options. You can often pay hidden APRs of between 20% and 40%. There’s very little flexibility to change your network or tariff. Once you’ve signed up to a 24-month contract, you’re tied in to the same network and price plan for two years. This means you’re unable to take advantage of cheaper SIM-only deals and promotions, and your mobile network has less ongoing incentive to keep you as a customer. There’s very little transparency about how much you’re really paying for your handset. As the cost of your handset and airtime are lumped together into one payment, it’s difficult to figure out how much you’re really paying for each. It’s difficult and expensive to change your handset early. If you’d like to change your mobile phone before the 24 months are up, you’ll normally need to pay off the remainder of your contract. Early exit fees can range to hundreds of pounds. You could continue paying for your handset even when it’s “fully paid off”. Your monthly fee is normally fixed so there’s no change after 24 months even once your handset is “paid off”. Mid-contract price rises apply to the entire monthly fee. On some contracts, there are annual inflation-related price rises. On a 24-month contract, this will apply to the entire monthly fee. On loan-based handset financing options, the inflation-related price rise will not apply to the cost of your handset. With a payment plan, you’ll have separate agreements for your handset and airtime. The most popular alternative to 24-month contracts is taking out a loan for the cost of your handset and then paying for it in monthly instalments (typically over 6 to 24 months). This allows you to get a SIM card separately from any mobile network without you being tied in to a 24-month contract. You’ll normally save money compared to a 24-month contract. You’ll pay interest on the cost of your handset, but this is often much lower than the hidden APRs included on a 24-month contract. There’s greater flexibility to change your network or tariff. As your handset repayment plan is separate from your airtime tariff, there’s greater flexibility to change your mobile network or tariff at any time. For instance, you could choose a SIM-only deal with a 1-month contract or a Pay As You Go deal. Greater transparency about the cost of your handset and tariff. You’ll always know exactly how much you’re paying for your handset, and how much you’re paying for your airtime. There’ll be separate payments for each. Change your handset at any time and pay off your loan early to save money. You can change your handset at any time without incurring hefty early termination fees. You can normally also pay off your handset loan early to save on the interest payments (you may also be able to reduce the length of your loan). Buying your handset on a separate repayment plan is sometimes known as getting an unbundled deal. In the UK, Unshackled has been at the forefront of promoting unbundled deals. For instance, they offer an unlocked iPhone X at the cost of £999 when purchased outright. On a payment plan, this splits out as £49 upfront followed by £43.52/month for 24 months (subject to an “excellent credit rating” giving an illustrative APR of 9.7%). The benefit of choosing a payment plan from Unshackled is you’ll then be able to choose a SIM-only deal from any network. For instance, combined with a SIM card costing £13/month, the total cost of ownership would be £1,405 over 24 months (about £150 to £200 cheaper than a traditional 24-month contract). Combining Unshackled’s 24-month payment plan with the cheapest SIM-only deal on each mobile network with at least 2GB of data. You could potentially save even more money by choosing a SIM card from other networks like giffgaff, iD Mobile or Plusnet Mobile. 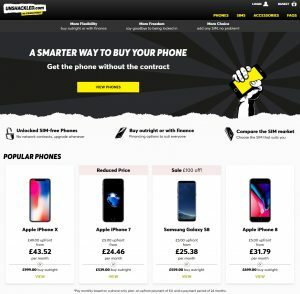 You can also get a 24-month repayment plan direct from some mobile networks (including the giffgaff phone store, O2 Refresh, Tesco Mobile Anytime Upgrade and Virgin Mobile Freestyle). However, these plans typically come with less flexibility as you’ll still be tied in to a single mobile network for your airtime. It’s also possible to do-it-yourself by buying a handset off-contract from retailers like John Lewis, Amazon or Argos. You can then take a separate financing product (e.g. from your credit card company). PCP-style payment plans are very similar to the PCP plans used for buying a car. A more recent innovation is the introduction of PCP-style payment plans. 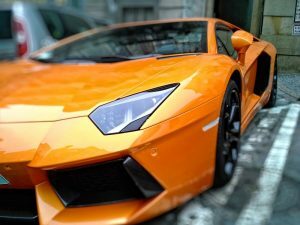 Working in a very similar way to personal contract plans (PCPs) that are often used for buying a car, this new type of plan gives you lower monthly payments with the expectation you’ll later trade-in your handset to pay off the remaining balance on your plan. The best example of a PCP-style plan is Unshackled’s Switch 24 (previously known as the 29 month plan). You can trade-in your phone to clear the balance on your loan. Unshackled gives you a “minimum guaranteed phone value” at month 24 subject to “fair wear and tear”. This trade-in value will pay off the remainder of your loan balance. You can continue paying for another 5 months if you’d like to keep your smartphone. If you’d like to keep your smartphone, you can continue paying for another 5 months to clear the remainder of your loan. If you’re to buy an iPhone X on Unshackled’s Switch 24 plan, this will cost £49 upfront plus £36.70/month (subject to an “excellent credit rating” giving an illustrative APR of 9.7%). The minimum guaranteed trade-in value after 24 months is £220 subject to “fair wear and tear”. Combined with a SIM card costing £13/month, you might pay something like £1,242 over 24 months. This is approximately £350 less than a traditional 24-month contract, though of course you’ll have traded in your handset after 24 months. 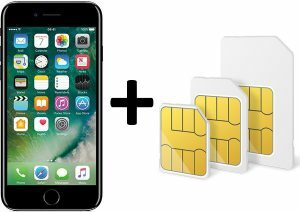 Combining Unshackled’s PCP-style payment plan with the cheapest SIM-only deal on each mobile network with at least 2GB of data. Sky Mobile’s Swap12 and Swap24 tariffs are PCP-style plans. Swap12: This is a 24-month credit agreement, giving you the option to trade-in your handset after 12 months. Swap24: This is a 30-month credit agreement, giving you the option to trade-in your handset after 24 months. In both cases, an “expected trade-in value” is calculated for your handset after either 12 or 24 months. This trade-in value will pay off the remaining balance on your plan. However, it only applies if you trade-in on that exact date, and will then decrease every month in line with your monthly repayment. This means there’s a lot less flexibility to choose your upgrade date. You’ll also be tied in to choosing a SIM card from Sky Mobile so there’s less flexibility to change your price plan or mobile network. For more information about handset financing options, please see our in-depth guide to unbundled deals and hidden mobile phone contract APRs. For more information about Unshackled’s plans, please see their official website.